Q. What is Company Profile (Resume) Matching? A. Matching is the main service Match Supplier provides. We will match you to the proper suppliers / buyers according to your supplies / demands. Through our Matching Service, you do not need to spend a plenty of time to find suppliers or possible buyers. Instead, you only need to choose your ideal suppliers / buyers from the list we send to you and contact them. Q. What are the features, advantages and functions of Company Profile Matching? A. 1. You do not need to spend a lot of time to find suppliers / buyers by yourself anymore. 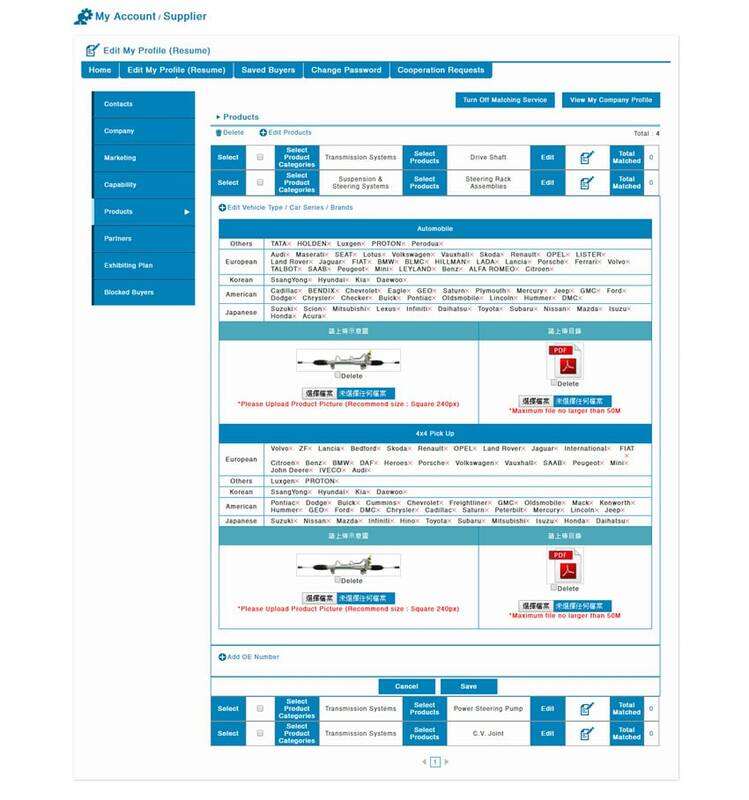 You will receive a list with Company Profiles that belongs to the suppliers / buyers match your demands / supplies. 2. It has the feature of convenience and will not be limited by spatiotemporal reasons that you can check the newest list anytime and anywhere if you have the internet. 3. Because the system matches you according to the information you wrote in your Company Profile, you will not receive any unrelated results. Q. How do I open / close my Matching Service? A. The default setting of Matching Service is Open. If you want to close the Matching Service, please go to My Account → Edit My Profile → Product Request (buyer) / Product Categories (supplier), and click on Close My Matching Service. Please go to My Account → Edit My Profile → Product Request → Edit the contents. Please go to My Account → Edit My Profile → Product Categories → Edit the contents. Q. What information will I see in my Matching Results? 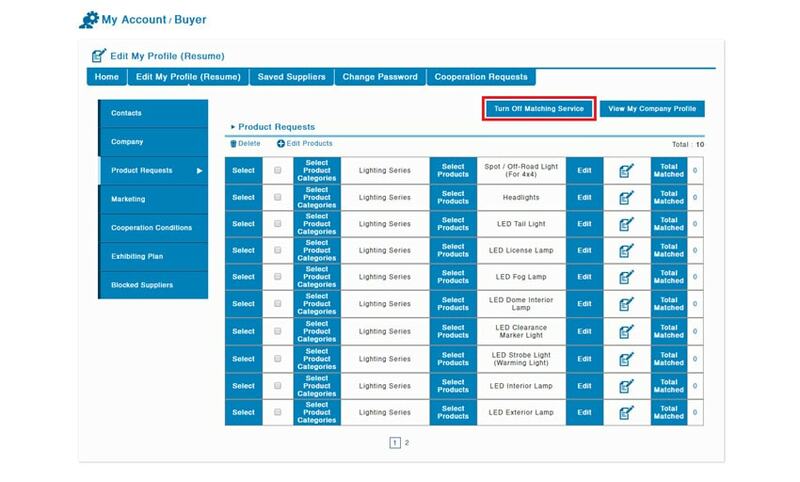 Besides, there are two buttons “Save Buyer / Supplier” and “Contact” located on the upper right corner. 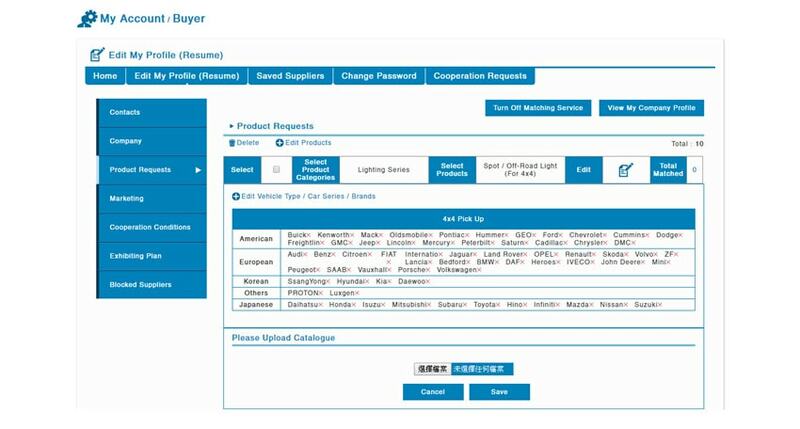 Users could choose to save the buyer / supplier and make a communication later, or contact the buyer / supplier immediately. Q. How do I add or remove matching conditions in my Matching Service? A. Please go to My Account → Edit My Profile → Product Request (buyer) / Product Categories (supplier), and edit the contents. Q. I have already registered for Match Supplier but I don't receive Matching Results updates. Why? A. Please check whether you turn on the Matching Service. You can find it in My Account → Edit My Profile → Product Request (buyer) / Product Categories (supplier), and check the button on the upper right corner. If your Matching Service is opened, the button will be Close Matching Service. When it is Open Matching Service, it means your Matching Service is closed. You can switch the Service with the same button.